Full on amaretti biscuit nose. The palate is bitter sweet with a lingering, slightly bitter amaretto finish. 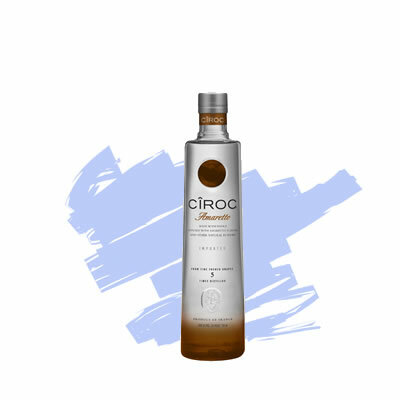 Cîroc® —the first vodka distilled completely from grapes — is made exclusively from two types of grapes grown in the centuries-old vineyards of the Gaillac and Cognac regions of France. Distilled exclusively from the fine French grapes, Cîroc® is vodka of the highest order. At the heart of this unique vodka are carefully selected grapes grown high in the Gaillac region of France. Cîroc is distilled five times to produce exquisitely smooth vodka. Unlike any other vodka on the market, Cîroc is made using fine French grapes. The grapes in Cîroc are hand-selected, from bunches left on the vine for an extended period of ripening. The juice pressed from Cîroc grapes is cold fermented. Never before has cold-fermentation been used in the making of a luxury vodka. Cîroc is five-times distilled to create a uniquely crisp, clean, smooth taste experience. Amaretto, a rich cherry and almond-infused vodka with a touch of vanilla and a smooth finish. 1. Shake vigorously in a martini shaker and pour over ice. 2. Squeeze in a wedge of fresh lemon and garnish with lemon rind.